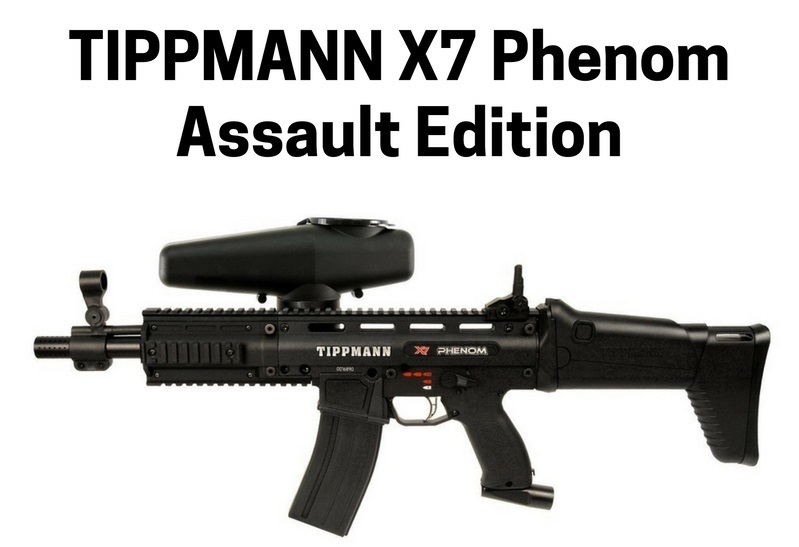 The Tippmann X7 is a robust gun, one with which you can take a tumble, dive and crawl, run and shoot, fire like 600 bullets and still get up and use it the same way you did when you first went out on the field, as long as you have gas and balls left. The mechanical version costs $299 and the electronic version just $50 more, at $349. For just $50 more, you get 5 firing modes that include safe full-auto, NPPL, PSP, Responsive and semi-auto. Please note that safe full-auto mode in the electronic version requires you to pull the X7’s trigger 3 times before full-auto is engaged. This is something to keep in mind as it might not be to everyone’s liking. It is a little annoying to get used to but you won’t even know you are doing it after a few times. At $300 for the mechanical version, you get a fantastic deal in the sense that a cyclone feed hopper is included with the gun. It is air powered and will not require batteries. Capable of feeding up to 15 balls per second, this hopper very rarely chops balls. The gun uses FlexValve technology that limits operating pressure to below 300 psi. Though high-end electronic markers are capable of operating at pressures of just 150 psi, 300 psi is pretty low for a fully mechanical and powerful gun like the X7 Phenom. Just so you know, other guns, even from Tippmann itself, use about 800 psi as operating pressure. Considering that, 300 psi is very,very appreciable. The cyclone fed hopper that comes with the gun holds a very healthy 200 paintball count, letting you rain down on your opponents. Another cool feature about the hopper is that it doesn’t have the typical tall profile that other top loading hoppers have. It also doesn’t require a battery as it is air powered. The barrel shroud has Picatinny rails on the top and bottom that allow you to customize the gun with useful accessories like optics, laser or a camera if that is your thing. If you do get the electronic version and run out of battery mid-game, you can without breaking a sweat simply toggle back to mechanical mode and fire away in semi-auto or rapid mode. Even changing out the dead battery for another battery that you have on you is a pretty easy procedure, requiring nothing but a pop-out of a door on the back of the e-grips. We mentioned in the gripes that a small number of X7 Phenom users have complained of gas leaks. As mentioned earlier, Tippmann will immediately cater to your needs if you do run into this problem, sending you a new gas line that you can simply swap out in your gun. The 2 year Tippmann warranty comes in very handy here. But, to minimize the chances of developing a gas leak, we recommend that you use only compressed air on your X7 Phenom. You will have almost a 99.9% chance of not developing a leak if you used compressed air instead of CO2. CO2 is a little erratic when temperatures are less than ideal as they contract or expand significantly, increasing risk of leak. Compressed air on the other hand is not subject to this risk. The trigger is solid metal and the gun is mostly constructed with a push-pin design, meaning that taking it apart and putting it back together is incredibly easy, without the use of Allen keys. The stock barrel is pretty accurate, with an effective max range of about 100-130 feet, depending on conditions. But, it loses accuracy when the range is extended to the 150 feet that Tippmann claims this gun has. However, an upgrade to an excellent barrel like the 14′ Lapco Big Shot will give you extended range and fantastically increased accuracy, especially in the medium range. At 50 feet, using the Lapco barrel, you can keep grouping down to a circle with just 2-5 inches in diameter. Many paintballers have actually been able to use the X7 Phenom as an assault sniper rifle, using balls so sparingly as they are able to go for head shots with this fantastic barrel. If for some reason you don’t like Lapco, you can also consider the pricier Deadly Wind Null Carbon Fiber Gun Barrel that comes in 12′, 14′ and 16′ sizes. Retailing at about $60 at Amazon.com, this barrel is incredibly light, weighing in at just 50 grams. Though light, this barrel can actually be run over by a car and remain unaffected (Yes, it has been done on YouTube!). This is a particularly good barrel to choose if you are going to use your X7 Phenom in speedball environments. In conclusion, if you want a mechanical gun that you want to slowly mod your way up to a high-end electronic marker, this is without a doubt the gun to choose. Many claim that this is the best gun that Tippmann has ever made, though it came out a long while ago. Ask any seasoned paintball veteran about a recommendation for a durable, accurate and performance oriented mechanical marker and you will almost always here Tippmann X7 Phenom Assault Edition. When you re serious about the look of your gear and even more serious about performance, the Tippmann X7 Phenom is the preferred choice.